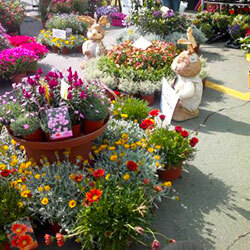 Stalls of flowers for "Sant'Agata in fiore"
Enjoy the springtime taking a walk along the big flower and plant market set in Via Circondaria Est, that will turn the town into a gardern with entertainment and fun opportunities. Some stalls will also sell handicraft, natural and organic products, items and accessories for gardening, ornamental decorations and outdoor furniture. The food stand serves traditional crescentine and piadine with cold cuts. In the same day the association "Prima o poi" organizes the non competitive race of self-made carts pushed by hands (the "Gara di carriolini").